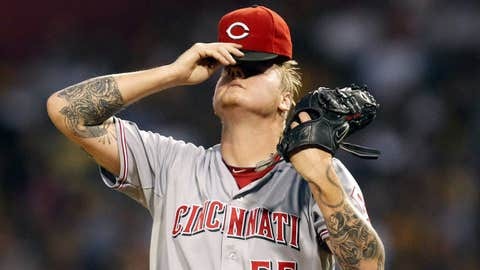 Cincinnati Reds starting pitcher Mat Latos reacts after surrendering two home runs to the Pittsburgh Pirates during the first inning at PNC Park. Mat Latos is making solid progress after undergoing offseason arthroscopic surgery to remove bone chips from his right elbow. The Reds starter, who was passed over for the NL wild-card game start because he was dealing with elbow pain, says he’s been long tossing and that his elbow feels better than it had in years. MLB.com’s Mark Sheldon caught up with Latos during Thursday’s Reds Winter Caravan stop and reports that Latos’ offseason program is right on track. "I’m at 120 feet. Everything is fine," Latos said on Thursday before the start of the 2014 Reds Caravan. "I’m getting everything stretched. I want to long toss, get extended and get everything stretched out. I actually feel like I’m behind right now. They said I’m on schedule," Latos said. After taking a break from throwing because of the caravan, Latos will resume on Saturday and throw from 120 feet next week also. On Jan. 31, he said he’ll throw 10-15 pitches from an indoor mound. Latos is expected to be fully recovered before spring training and generally speaking removing bone chips (and/or bone spurs) are relatively minor procedures for pitchers.